Questionably canon, definitely an article. The leaks strike back and early! 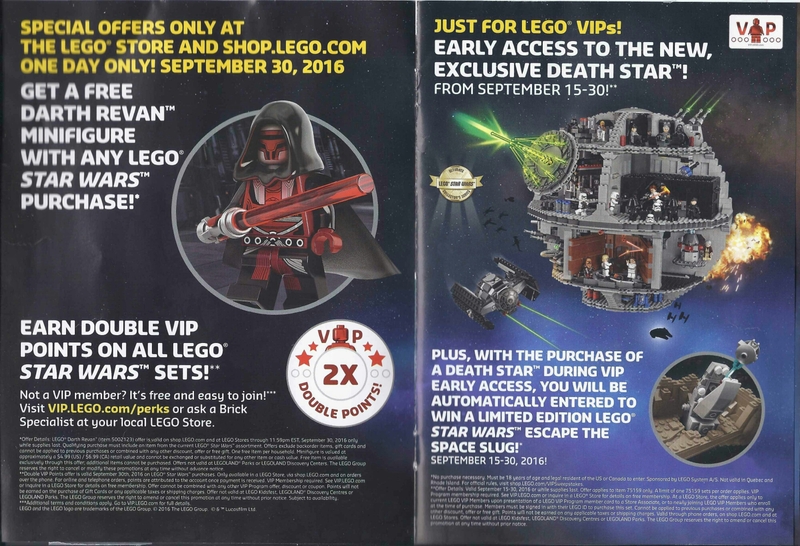 Check out possible summer 2017 Lego Star Wars set names! Hoth Bricks has posted a rumor list for Summer 2017, and although a bit vague, it’s very interesting. Special thanks to them for digging this up! I’ve posted a translation below and converted the approximate prices from Euros to USD based on what is usually seen at retail stores. Of course if you dislike toy spoilers and would rather be surprised when the news is released officially, I’d understand if you clicked away now. So with what we now know (or can start to assume – this is still a rumor after all) it’s time to speculate! The battle packs are specifically noted a Episode IV – VII. This variable is, in a word, huge. That gap of time can mean almost anything, barring prequels of course. But does it bar Rebels and Rogue one? Both are still prequels but they are direct prequels in the Original Trilogy timeline or concurrent with the original films. If they go for the earlier parts of that timeline, that could easily mean rereleases of battle packs that haven’t been done in a while, most likely the classic Rebel troopers from Episode IV or maybe Snowtroopers from Episode V. Personaly, I’d like to see the Mandalorians turn up in a battle pack again. Perhaps the new ones from Rebels who are loyal to the Empire? More Mandos would make a welcome addition to the Death Watch and Shadow Collective minifigures Lego has already released. But who knows? Battle packs sometimes have oddballs like the Senate Commandos pack (Clone Wars) and even pull from the Expanded Universe with the Shadow Troopers pack, one of my personal favorites. You can’t count out the odd chance of getting something like a Tusken Raider battle pack (because we know a new Landspeeder set is coming) or maybe a bunch of Ewoks from Episode VI. And I didn’t even touch on Episode VII yet! But more on that in a bit. Next on the list is the Quadjumper from Episode VII. I think this is a great choice for a set. If you don’t recognize the name, it’s probably because the name is never spoken in the film. This is the ship that Rey insists is better than the Millenium Falcon (aka garbage), and seconds later it is promptly destroyed by TIE fighters in pursuit.The gigantic engines and unique cockpit would make this a fun build. I would suspect four to five minifigures to be included: Rey, Finn, and BB-8 of course, probably followed by a stormtrooper or two, maybe one of Unkar Plutt’s thugs in place of one trooper. This might be a stretch, but what about Constable Zuvio, who was cut from the final film? I’d love to see the set include some scenery too, like the iconic archway of Nima Outpost or the pool of water that thirsty Finn shares with the Happabore. Can we have a Happabore and the arch? I actually much like the sound of both! Perhaps one of the most interesting set names is the Rebel hangar. ok, the name isn’t interesting but I’d wager the contents are pretty cool I see this going one of two ways. 1.) Rebel Hangar (On Yavin) – Similar to how Lego sold Super Heros sets with all the Suicide Squad characters without actually putting ‘Suicide Squad’ on the box, this kit could be a tie-in across between Rogue One and the Original Trilogy regardless of whether or not Rogue One appears on the box. A good Yavin base would have the temple hangar and high-rising scout towers/defensive turrets and some lush green scenery. I suspect Mon Mothma may make an appearance in this base. She isn’t in Episode IV, but she is in Rogue One and a high-ranking rebel leader, so including her still makes sense. Besides that, the base may include a relatively small ship like an A-Wing as well as maintenance crews with tools and small vehicles, probably some crates and the like as well. So for figures, I’d suspect Mon Mothma, some classic Episode IV Rebel troopers, a couple stormtroopers, and possibly Luke Skywalker in his orange pilot suit. I’m having trouble coming up with a main villain for this one, so I’d say an Imperial Officer isn’t unlikely either. 2. ) Rebel Hangar (Home One) – I missed out on this set as a kid and adult me still wants one. Home One is the Mon Calamari cruiser from the huge space battle at the end of Episode VI. The original set included Mon Mothma, Admiral Ackbar, and Lando Calrissian in his general’s getup. I see a strong possibility that if this set was rereleased, not much would change. The control room of the cruiser sits adjacent to a hangar with an A-Wing and includes a trans-orange globe representing the hologram of the attack plan on the second Death Star. General Crix Madine, a Mon Calamari Officer, and an A-Wing pilot were also included in the set. While maybe not the prettiest set (the control bridge is great, but the hangar is pretty bare in my opinion) I’d love to see an update for this one. You’d be forgiven if you didn’t remember who the Guavian Death Gang was in Episode VII, but I bet if I told you they were the red guys with “Tell that to Kanjklub guy” Bala Tik you’d remember the scene. This is an interesting, somewhat unexpected rumor for me. I do hope it’s true though. The first Episode VII Black Series figure I purchased was one of these guys, and I have a love for bounty hunters and all-around weird mercenary characters. These red-armored, heavily-armed mercs look great in the Lego Force Awakens game and would look great in any Star Wars MOC. Speculation is that the set is actually the Eravana, Han Solo’s freighter from Episode VII. Unless it is somehow magically to scale and can fit a Millenium Falcon inside it, I’m not terribly excited. Okay, so of course I’m kidding – it will probably include a smaller Falcon to recreate that shot. Most likely the set will also include a Rathtar to reenact the comical monster chase that happens after Han Solo tries to simultaneously negotiate with the Kanjiklub and Guavian Death Gang. It will most likely also include Rey, Finn, and/or BB-8 since that’s all the characters in that scene. Bala Tik may appear as well as Tasu Leech, though that is somewhat unlikely since he is so minor and already in the newest Falcon set. And back to battle packs for a moment – what if one of them is the gang members from both Kanjiklub and the Guavians? Space scum and villainy might make a good battle pack! I’m going to skip ahead here to this article doesn’t end on something I know nothing about. I don’t watch the Freemaker Adventures (I just haven’t checked it out) so I’m not going to speculate on what those two sets are. I’ve heard mixed reviews of the shows, but have heard that there are plenty of enjoyable side characters that people would enjoy seeing in future sets. Anyway, back to the hype train. Up next is the Imperial Hovertank. We’ve already received a set with this same name for Rogue One, so I’m wondering if the name is a stand in. I’m going to throw it out there that if this rumored name is genuine, it’s an Imperial version of this set, similar to how the V-Wing Starfighter had Republic and Imperial variations. Three figures is about standard for a set at this price point (albeit the Republic Hovertank only had two.) Just venturing a guess, it would come with two to three stormtroopers, one of which possibly being a driver similar to the Rogue One hovertank driver (though I doubt this will be another Rogue One set.) I missed out on this one the first time around, but since my collection is largely Original Trilogy-centric, I’d love to have an Imperial version of this classic tank. Darth Vader transformation is another surprise to me. I didn’t think it would appear again outside of the Epiode III wave from back in 2005. Another $30 set, this would be a wonderfully cheap way to obtain an updated Darth Vader with his two -piece helmet, new cape, and updated leg and torso printing. Most likely it would also come with the Emperor and a gravely-injured Anakin Skywalker. The Emperor will probably not get an updated appearance in such a small set (looking at you, post-UCS Boba Fett sets) but it will be great to get the medical droids and the Frankenstein-esque lab table. First impressions of this set have been comparing it to the scale of the Carbon Freezing Chamber, and I’d say that’s a fair comparison to make. It’s nice to see Lego throwing some scenery into these kits for a change, too. Last but not least, the advent calendar. We’ve seen exclusive holiday variations on Darth Maul, Yoda, Jango Fett, R2-D2 and C-3P0, Darth Vader, a clone trooper, and Chewbacca. (I went from memory there, let me know if I missed any) Who will be in the holiday special this year? We can count on the usual variation of troops that happen to feature snow gear, usually one Imperial snowtrooper and one rebel trooper, but I’m always more excited for the other oddballs that make it in, sometimes as exclusives from other sets or background characters with elaborate backstories. For the holiday figure, I would suspect Emperor Palpatine (because he’d go nicely with Vader), but it could be anything from Boba Fett to an Ewok to fat old Captain Rex in a Santa suit. Only time will tell, and as always, you have to pick these up in the summer when they come out to make sure you get yours. Is it just me, or do they always seem limited? That’s it for my speculation on this list! All in all I think we have a lot to look forward to, judging by this and other leaks I’ve come across. On a side note, I will comply with Lego if they request this to be taken down. They’ve requested to have leaked info taken down before and they have every right to do that. I didn’t find this information myself so I’m just the messenger here. That being said, I hope you enjoyed the article, and thank you for reading this far! If you liked the article, let me know in the comments, and join the speculation with me if you want! My favorite part of building as far as Lego Star Wars goes is building characters that Lego doesn’t officially make, but working within the limits of pieces Lego actually produces. It’s like a puzzle, finding the piece in the right color or printing, finding the right hair, helmet, or weapon to make the perfect vision of your favorite characters. Whether you call it kit-bashing, making a purist custom, or simply part of your MOC (Lego-speak for ‘my own creation’) I can’t leave a toy store without ideas for new characters. So it seemed fitting to make my first posts about custom Lego figures based on one of the first characters I wanted to build; Kyle Katarn from the Star Wars Dark Forces, Jedi Knight, and Jedi Academy video games. Kyl Katarn has worn many hats, so to speak. He defected from the Imperial Stormtrooper Corps (traitor!) and went solo, eventually becoming a mercenary and smuggler before eventually following the ways of the Jedi. I don’t want to spoil too many of his stories because there are so many and they’re all pretty good. I would highly recommend Jedi Outcast and Jedi Academy. Not only are they two of the best, most fun Star Wars games I’ve ever played, they’re two of the best video games I’ve played overall. The lightsaber combat system has never been topped by another game, and until virtual reality tech is perfected, it probably won’t be bested for a while still. Kyle and his good friend, fellow smuggler Jan Ors. Kyle has been an ongoing project, using the torso from an old Anakin Skywalker, brown pants and hands, and the head piece of a character from the Lake Town Chase set from The Hobbit. Here he is pictured with his blue lightsaber and faithful Bryar blaster pistol. I’m not 100% satisfied with how Jan turned out, but part of the fun is redoing these figures over time. Jan has Rey’s face, a Battlefront Rebel trooper body modified with white arms, and long black hair. He was known to get himself into situations where the odds were overwhelmingly against his favor. . .
Kyle was strong in the Force and skilled with a lightsaber. . .
. . .and he battled his own dark side as often as he battled the dark side itself. Luke Skywalker, who might know a thing or two about the dark side, helped Kyle through his dark times and helped him become a great Jedi. Together, they trained new Jedi at Luke’s new academy. Thank you for checking out my custom figures! Let me know if you like this format as I’d like to branch out into doing Lego Star Wars stories (almost like a webcomic) in the future. If you liked the post or have any ides you’d like to see in the future, leave me a comment or visit the contact page. I would love to hear your feedback!